Nashi is a brief seasonal crop – there’s only a couple more weeks to go. The Kanes’ nashi are superb and they’re grown using minimal sprays. They could be exporting, but we’re lucky that they choose to sell locally. 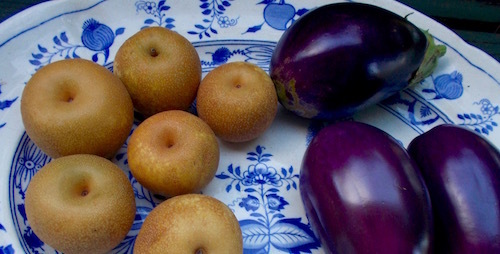 Another great crop that’s fresh-picked at this time of year is eggplant. Last Sunday there were piles of excellent eggplant, all different shapes and sizes, on several market stalls, including the Kanes, David from Suncakes Gardens and Clif’s Gardens. We came home with two big bags full. We’re planning to make several jars of fabulous Korean-style eggplant kimchi. See the recipe below. And here’s a link to some other great eggplant recipes. Kanes’ nashi, sliced thinly, sweet late watermelon from Clif’s Gardens and a handful of black grapes grown by Sharyn from the World Voices singing group. Perfect with a spoonful of Caspian Sea yoghurt. 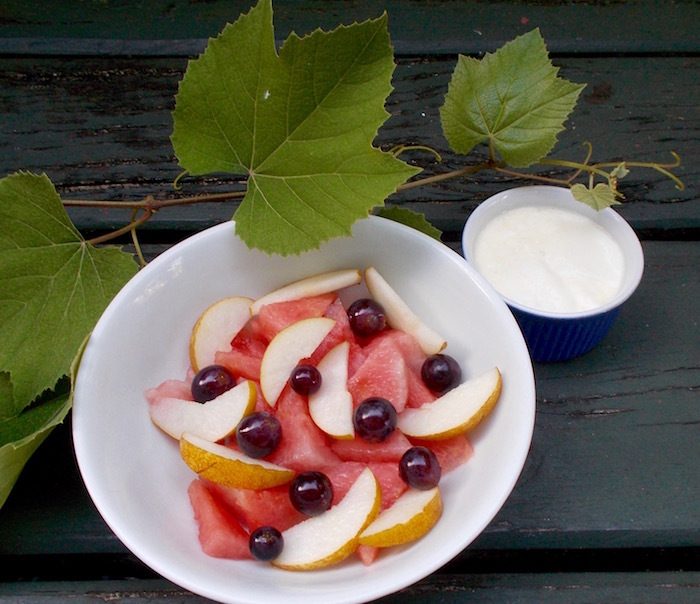 Above: Nashi, watermelon and grapes make a beautiful fruit salad. Put a small bowl of this delectable pickle on the table with any Asian-style meal. This is adapted from a recipe in Home Style Korean Cookery by Cho Joong Ok.
Slice eggplant into small strips, approximately 2.5cm x 0.5cm. Soak in water 1 hour. Squeeze out, but don’t rinse. Place eggplant in a jar and pour over the other ingredients. Add a bit more soy sauce if there isn’t enough liquid to cover the eggplant when you press it down with a fork. Let stand one night and then serve. It’s even better after a few days. It keeps for at least a couple of weeks in the fridge.